Robert Herrick. The Poet hath Lost his Pipe. THE POET HATH LOST HIS PIPE. And give it to the sylvan deity. Terbrugghen. 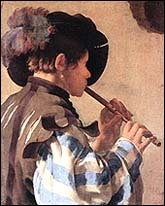 The Flute Player, 1621. London, Lawrence & Bullen, 1891. 2.